Amazon CEO Jeff Bezos has taken the No. 1 spot on Forbes’ list of the 400 richest Americans. Bezos became the richest man in modern history earlier this year, and has a net worth of $US160 billion; last year, his worth was $US81.5 billion. Since becoming the richest man in modern history earlier this year, Amazon CEO Jeff Bezos has taken the No. 1 spot on Forbes’ list of the 400 richest Americans – a shift that bumped Microsoft cofounder Bill Gates to second place. Bezos’ net worth jumped from $US81.5 billion on last year’s list to this year’s $US160 billion. He’s the first person to surpass a net worth of $US150 billion since Forbes began tracking the richest Americans over 30 years ago, and the first person to bump Gates out of the No. 1 spot on the list for 24 years. Following Bezos and Gates is Warren Buffett, with $US88.3 billion; Mark Zuckerberg, with $US61 billion; and Larry Ellison with $US58.4 billion. However, there’s one aspect on the list where Gates still beats Bezos: philanthropy. This is the first year Forbes has included a “philanthropy score,” which measures and scales the billionaires on the list based on their generosity on a scale of 1 to 5. 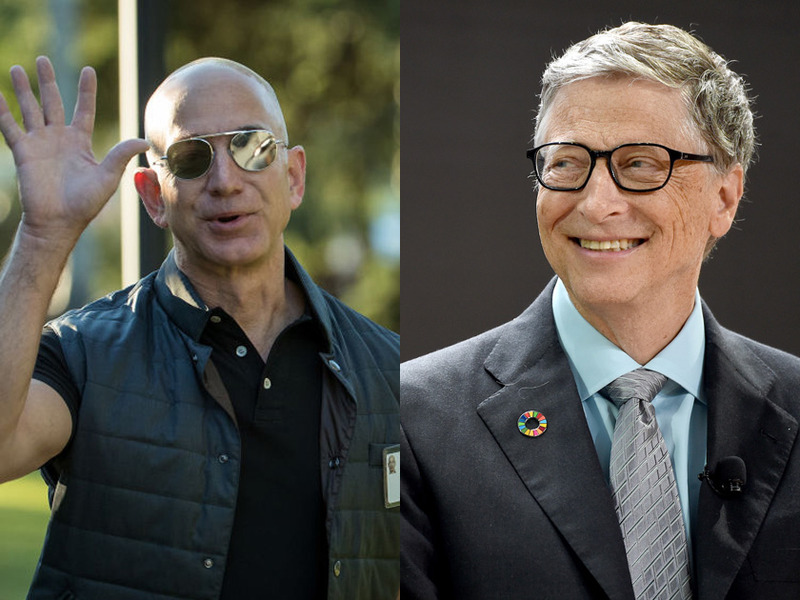 Bezos received a philanthropy score of 2, while Gates received the highest score of 5. Bezos became the richest person in modern history earlier this year, at a time when Amazon was criticised for poor working conditions and when a group of its workers were on strike. Amazon just recently announced plans to raise the company’s minimum wage in the US to $US15, which will take effect on November 1. Amazon will also increase wages for employees outside the US as well, according to a company spokesman. To see Forbes’ list of all 400 of the richest Americans this year, click here.